A trio of longtime Democratic donors are set to make a movie about the Washington Post‘s role in exposing the "Pentagon Papers." Tom Hanks and Meryl Streep are set to play editor Ben Bradlee and publisher Kay Graham, respectively, in The Post, which will be a drama about the newspaper's efforts to expose the secret government study about the Vietnam War, Deadline reported Monday. Hanks, who recently bought the White House press corps a new expresso machine, donated to both of Barack Obama's presidential campaigns and has given nearly $200,000 to the Democratic National Committee and other Democrats. 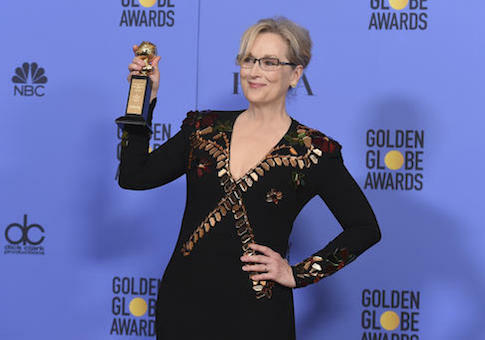 Streep gave nearly $40,000 to Democrats in 2012, and she made headlines in January when she railed against then-President-elect Donald Trump in a Golden Globes speech for what she called offensive rhetoric. The two Hollywood stars will be directed by Steven Spielberg, a frequent Hanks collaborator who has donated millions to the Democratic Party and liberal causes. Deadline called the project a "timely film about the vital role of the press in keeping government honest." The Washington Post led its own write-up of the story with the sentence, "With journalism and ‘The Hollywood elite' consistently drawing ire from the Trump White House, it's no surprise that the two would eventually team up." The newspaper appeared to imply that the two left-leaning establishments had never had common cause before. The Washington Post has featured prominently in films before, most notably in All The President's Men (1976), the story of journalists Carl Bernstein and Bob Woodward uncovering the Watergate scandal. This entry was posted in Politics and tagged Democratic Donors, Hollywood, Meryl Streep, Steven Spielberg. Bookmark the permalink.